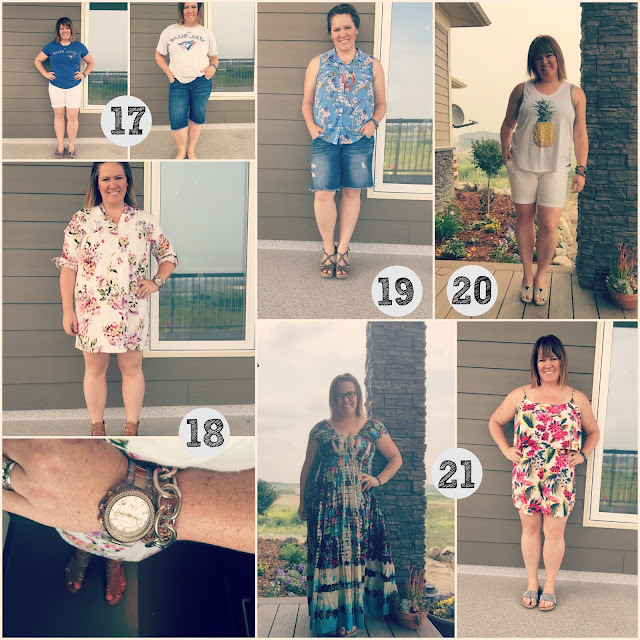 It's the last summer style challenge post for this year. As of now, I'm undecided if I will continue with the challenges. I know for sure I won't do the Work Wear one next month, it's the fall challenge that I'll really have to think about. OOTD 17: Graphic Tee + White Shorts + Striped Espadrilles- This was Canada Day and what better way to be as patriotic as Canadians do patriotic than by sporting my favourite Canadian team's shirt. I have two outfits..one following the guidelines and then the other is what I actually wore. OOTD 18: White dress + Necklace + Metallic Sandals- I just got this shirt dress from Winners on my date with my mom last week and I couldn't wait to wear it. I even wore it out to the movies with Candace and Sara (Magic Mike XXL)...it was so comfy! OOTD 19 : Flowy top + Boyfriend Shorts + Necklace + Wedges - Sarah and I have the same top and when I saw that she styled it last week, I knew I had to throw it in this week somewhere. I wore this outfit all day, minus the wedges. OOTD 20: White tank + Lace Shorts + Wedges - Lace shorts are my thang, so I just wore my normal, boring shorts. I loved this outfit and wore it most of the day. OOTD 21: Maxi Dress + Metallic Sandals - I was feeling brave early in the day and thought it would be the perfect day to debut my floral romper, sans vest. But it was cold, so I changed to my maxi and was quite happy wearing it. As I sit and write this post, realizing that I normally, at this point, would go into depth about one item, I can't find anything I really want to talk about. And because it's the last summer challenge link up, I just want to go on the record saying that I had fun with this one, even though I was hesitant to sign up. I think I enjoyed it because I felt comfortable with what works for me and wasn't feeling like I needed to buy something just because it was on the list. I used the shopping list as a guide and decided what would look good on my body and/or suited my style. I guess that's what the important part to me: finding what suits my body and my personality and going with it. Short and sweet for today. Come back Friday when the Style Me Bloggers talk their Summer Go-To Style....I have yet to figure out what is stylish about my go-to style.....yikes. I love that pineapple top! I loved how you put your collages together this challenge. Yes to dress #19 and Magic Mike, I saw it last weekend too ;) I liked it better than the first, you? Great Looks! Love that maxi!! And the flowy pineapple!! Love your thoughts on the challenge as well!! well you rocked the looks as per usual! love the floral pattern pieces, so pretty! Oh, my you have a pineapple tee! Now I really want one because your style is always the coolest! Like you graphic updates...so pretty! I have to remember to link up with you all on Friday! That pineapple top is awesome! I agree with Lana that you had some really pretty looks all the way through the summer challenge. This maxi dress is sensational. Can envision you wearing it and Lucia wearing something similar and the two of you sitting in a field of daisies making garlands. Very mother Earth and pretty. Pineapple tee outfit is my fave here. I get more caught up in "the list" than I want to admit! I think it's my fave too. I would love to sit in a field and play Mother Earth. I would definitely wear that maxi. Wait, did you do a design update? Love the watercolor look! And don't mind me if you have had this design for awhile 🙈 I really like that floral top you and Sarah have.